I’ve been through this before. The flurry of publishing a novel, announcing the launch, marketing…. And then? The crash. You’re done, burned out, ready for a break. This stage lasts about two days and you’re antsy to start on another story. But what if you have no ideas at the moment? You fret and worry and the more you reach for an idea, the more elusive it becomes. That’s when you launch into major cleaning, declutter the house, become obsessed with social media and spend many too many hours on the Internet. Where did that germ of an idea come from? For the life of me, I can’t remember, but it grew into a two-novel-set of mystery, adventure, and romance—Alzheimer’s, a reporter fleeing across the Sahara, a son and daughter-in-law trying to decode a mother’s notes, a man waiting to be caught and tried, and the young girl trying to save him…. I’m ready to write, but again I’m wallowing in writer blackout—no ideas, none, zilch. What to do? Clean, declutter the house, spend many too many hours on the Internet, go to Mexico for Christmas and wait. Something will pop up. Of that I am certain. Meanwhile, I have time to relax and read, read, read. P.S. 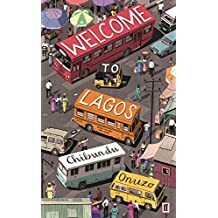 Currently I’m reading the amazing, brilliantly written Welcome to Lagos by Chibunda Onuzo.